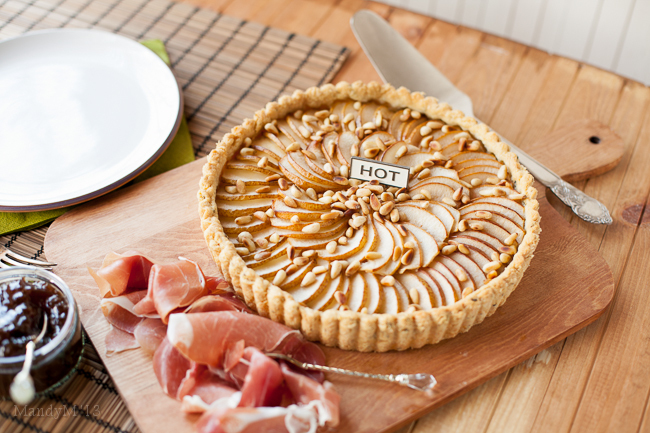 Goats Cheese, Pear, Pinenut & Prosciutto Tart — What the Fruitcake?! And then there were 11! Great Irish Bake Off contestants, that is. The first episode of Ireland's first ever series of GIBO was a great start. We met our contestants, of whom I already have a few favourites, as well as our judges and presenter. We also said goodbye to the amazing Laura. But here we are, episode 2, and with it, my thoughts about the goings on in the programme. Episode 2 was all about tarts. Anna seems to be a fan of tarts, she even said as much, and I can't blame her, they are lovely things. Relax, I'm talking about the food. The contestant's first Show Stopper of the series had them making a sweet and savoury tart. I had already decided that I would try a savoury tart as I'm always telling myself to do more for the blog. Then some of the contestants on Twitter egged me on to also make a sweet tart. I can't say no to a baking challenge. I'm just weird like that. So somehow, between spoiling Andrew with anniversary treats over the weekend, I also managed to do a last minute sweet tart. Unfortunately, being pressed for time (and the earlier setting sun) I only managed to try the recipe once. And to be honest, the recipe I tried was kinda awful. The concept was good (Plum & Greengage Custard Tart), the actual recipe, however, not good. So I'm sorry, but you're just going to have to be happy with just the savoury today. But I promise, it makes up for everything. Pear and goats cheese together, yum, and it's a classic tart combination that I've been wanting to try for a while now. Why the pinenuts and prosciutto? I like alliteration. I also like pinenuts and prosciutto. I particularly love toasted pinenuts. I think most nuts are better when roasted or toasted, their flavours enhance and they dry a little making them a bit more crunchy. I love dishes with different textures and the idea of flaky pastry, soft and creamy goats cheese with tender pears and crunchy little bites from the pinenuts just really appeals to me. The prosciutto adds a lovely saltiness and also acts as a sort of garnish. We also eat with our eyes, and while the thin layers of pear is rather lovely, top off a slice of this tart with a crumpled pile of prosciutto, it just looks even better. Now, at this stage you might be thinking that this tart might sound as though it's a little on the dry side. If you are, kudos, you're right. While the cheese is creamy, it's certainly not moist (how many times do you think I can use "moist" in this post?). The firm pears used also don't contribute much on the liquid side. I'm completely in love with caramelised onion marmalade, I think it goes with almost anything, so that's what I decided to serve with my tart. Now, at this point you might be wondering why I didn't just add it to the tart from the start. Well, to be honest, if I were to serve this for guests, I would offer two or three different marmalades or relishes for them to choose from. That way when they go back for seconds (and they will) they can try a different flavour combination. It would go well with a mango chutney or a sweet and rich tomato relish (Ballymaloe, if you're in Ireland), and of course, as mentioned, a good onion marmalade. Just a quick note on the pastry itself. I always think it's a shame when you go to the effort of making your own shortcrust and then you don't use the opportunity to add a little something to it. As nice as a good shortcrust is, you want it to be more than just nice. Buttery goodness = good. Buttery goodness + herb/spice = better. The flavour I went with was fresh thyme, and damn, it was good! So that's all I'm going to say about it. Just trust me, add some thyme. So there you go, a salty/sweet/creamy/crunchy tart that is perfect in mini or regular size as a simple starter, or generously served up with a gorgeous fresh salad as a main (vegetarian if you leave off the prosciutto), it's pretty, it's tasty, it's a Show Stopper. Now, on to episode 2! Like I said last week, my favourite thing about Bake Off is that it's actually about the baking. The only drama comes from flopped sponges and ruined batter. I don't care if he called her a fat cow, and I don't care if she said he can't boil an egg. I'm all about the natural chaos that is baking or cooking in a stressful competition environment, it's plenty entertaining enough. And this week didn't disappoint! While episode 1 had the contestants making a cake that my gran would have baked had she been a trendy baker in the 60's (she wasn't) for their technical challenge, this week was all about the tart. And to start with, a Bakewell Tart. But not just any Bakewell, this was a Bakewell that I might like to have as a best friend. No wait, that would then make me someone like Hannibal, 'cause the first thing I would do is eat it. Paul took the classic frangipane and raspberry jam tart and transformed it into something incredible. Jam, marzipan, fresh raspberries and frangipane made with my absolute favourite pistachio nuts. (I'll have two, please! ) This amazing Bakewell overhaul was our contestant's first challenge for episode 2. That's right, it started with a technical. But don't worry, just as our nerves settled and we thought Aoife's tart was fine, disaster hit. We actually heard the disaster before we saw it, and when we were shown the cause of the "Oh God...", I actually gasped out loud as it went oozing its way off the counter as the unbaked pistachio frangipane made a rather grotesque escape from the pastry shell. Noooooo!!!! You can just imagine what was said when it was put in front of the judges. I won't go there. I'm still tartshell shocked. Tom's bakewell was the first to be judged and it looked like a great place to start. It looked good with perfect raspberry rings and a perfect bake, and Paul and Biddy loved the flavour. His only downside was that his pastry was just a touch too thick for their liking. From Star Baker to Under Baker, Maryanne didn’t start off very well. Her bakewell looked quite good, but on closer inspection, Paul pointed out that you could see that the frangipane was still raw in the middle, and raw it was. She took 7th place. Not good Maryanne! Barbara had a good technical bake. Her tart was evenly baked and baked just enough. Paul also really enjoyed the flavour of the marzipan in her tart, even going as far to single it out and call it striking. Definitely 2 raspberry rings there, sorry Jarek! Jarek was truly pissed that Paul missed his second ring of raspberries, but in fairness to Paul, Jarek had put spaces between each berry and Paul somehow managed to cut a slice that missed cutting into the second raspberry ring. The judges honestly didn’t see it and I could see why. Steve’s Bakewell looked amazing, and if not for his decorative touch with the pastry leaves, might have walked off as winner of the Technical Bake. But he can be very proud that it was only because of his artistic flourish that he lost this win because Biddy and Paul really struggled to choose the best Bakewell between himself and Oonagh. In the end, Oonagh’s Bakewell was exactly what the judges were looking for. Well baked, a super thin crisp pastry with great flavour. The glazing was just right and you could see two near perfect raspberry rings. She deserved her Technical Bake win. This week we lost the Signature bake, but in its place, we got the much asked for Show Stopper instead! I just love the Show Stopper round. The bakers are given near carte blanche in this challenge. The only rule set was that they had to make two tarts. One sweet, one savoury. I liked the sound of Aoife's "redemption" tarts. Particularly the Goats Cheese, Potato and Chorizo. I was also looking forward to Maryanne's Red Onion Marmalade with Mediterranean Veggies in Rough Puff Tart, Will's Profiterole Tart and Bridget's Orange and Chocolate Tart. The judges were faced with an amazing array of tarts and I honestly wish it had been me in one of their seats, only because I wanted to be the one tasting all of them! Marryanne's Mediterranean and Red Onion Marmalade tart looked stunning! Ribbons of courgette, creamy cheese and roasted red peppers. Just gorgeous. The judges enjoyed it, although Biddy had wanted a bit more roasted flavour from the veggies, but they also praised her sweet tart, Paul calling it, "spot on." I was especially impressed with her sugar work, that's something I've yet to attempt. Although Paul said that Tom's savoury tart was best eaten in the dark because it wasn't much to look at, he loved the flavours. And Tom was right, once it was cut into, he'd constructed a beautifully layered filling. I was happy to see that Will's Profiterole tart was also a hit, it was one of the tarts that had intrigued me. Salted caramel, chestnut cream, all topped with light and fluffy filled profiteroles. Good gosh man, it's like you know me! While Will's Technical Bake was a little disappointing, he really made up for it in this round. Unfortunately Steve had seasoning issues with his Smoked Haddock and Sweetcorn tart, the fish was already too salty, so it ended up over-seasoned. Don't worry Steve, I've been there. I think I was about 8, and the first time I ever made a tuna salad I added loads of salt, 'cause obviously you add salt to a salad. My poor parents tried their best to eat it, but no, it was revolting. I'm not saying yours was as bad as that, but I'm just commiserating with you. While Bridget's tart looked lovely, it was confirmed that it was soggy. (Come on judges! Say bottom! Soggy bottom!) By the way, Bridget was on great form this episode, I'm definitely loving her sense of humour. Stephen was having a great Show Stopper. His Exotic Fruit Tart looked good enough to be in the window of any fancy shmancy patisserie. Biddy gave us a look that had me wonder if she was enjoying the tart or thinking of a steamy night with George Clooney. Paul didn't give us the same face, but was also thoroughly blown away with it, "My God, that's bringing my palette back to life, I tell you." Stephen, I reckon you'll be getting a job offer from him soon! I mean, come on, Paul even asked for the recipe. Dude, nicely done! Jarek was still upset about Paul missing his raspberries when coming in to the Show Stopper challenge, and this time made sure there were plenty of berry rings in his White Chocolate & Strawberry Tart. It was quite funny watching him give out about the missed berries. Thankfully, Paul had good things to say about his Strawberry Tart. Even with the great feedback, Jarek couldn't stop himself from being a little cheeky and asking if the pastry was okay. Not that that's cheeky, it was the way he asked. Paul responded with the same level of cheekiness, also going out of his way to note the nice berry circles. Going to have to keep a close eye on Jarek, he might end up being great entertainment! No Daire, don't do it! Daire didn't have a great round. His savoury tart was bland, and in my opinion, his Apple and Blackberry Tart looked more like a pie. It was even finished off with a bit of cheese, not in the savoury form, but of pastry leaves and berries painted with food colouring. Not too appetising I have to say. He had been warned by Paul about using too many cloves, and sadly that's exactly what he did. Aoife did indeed redeem herself with her tarts. I'm definitely going to be scouring the TV3 website for her recipe. I'm a sucker for chorizo. I was very pleased to see that this week we'd be witness to the judges deliberating. I definitely missed it in episode 1 as I think it's a very important part of the show. Being reminded who is in the top and bottom positions, and why they're there, helps to back up their final decisions. I guess they were tight for time in episode 1, but hopefully now that we have it, we'll get too see it for the rest of the season. In the end, I agreed with the decision. A well deserved Star Baker went to Oonagh. And, still sadly, leaving us this week was Daire. He did just fail to impress. I'm sorry Daire! But keep baking! For the official recipes from the show, visit TV3's website. 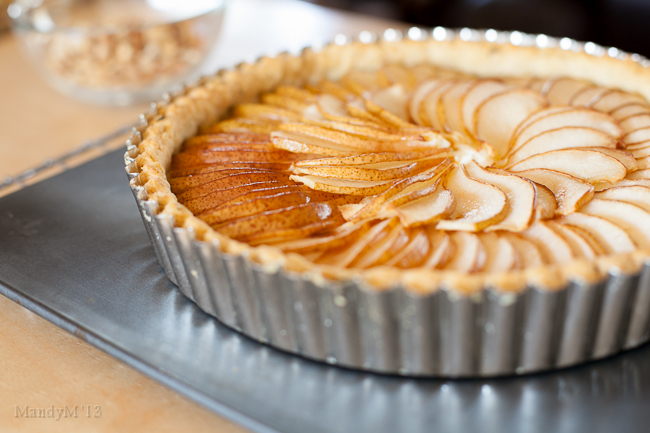 But if you like the look of my tart, here's the recipe. 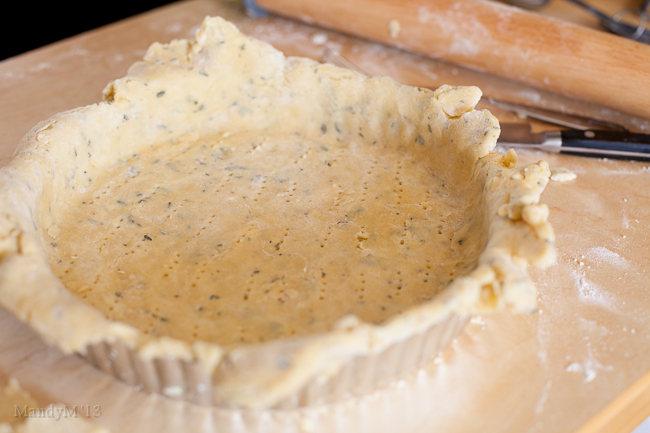 You can, of course, add your relish, chutney or marmalade of choice to the tart before baking. Simply spread over the pastry before adding the rest of the ingredients. A trick I learnt to help keep your pastry crisp is to brush the pastry with beaten egg after you've removed the baking beads/beans and before you return the pastry to the oven for the last 5 mins of baking. This helps seal the pastry so that less moisture can seep into it. The above amount of pastry will make +- 12 individual tartlettes. I do not represent GIBO in any official manner, I'm doing this purely in my own capacity as a baking obsessed blogger who loves the Bake Off franchise. Although, I have been given permission to use certain official photos etc. which is pretty cool. But TV3 has their own official GIBO website running, sponsored by Odlums, and they have loads of great content like recipes from the series and more, so check it out. Posted on September 26, 2013 by Mandy Mortimer and tagged Savoury Tart GIBO Great Irish Bake Off Goats Cheese Pear Pinenuts Onion Marmalade Onion Relish Prosciutto.